At the end of a long work day, all I want to do is veg out in front of the TV mindlessly for a few minutes before passing out for the night. That said, my parents and brother had a bit of an “intervention” with my last week when I was sick (that’s why I’ve been so MIA on the blog lately) and told me I need to find some hobbies besides just working on my business and watching TV. I got what they were saying though, so I decided to brainstorm some ideas that I might be able to use instead of automatically turning on and watching TV the next time I take an evening or weekend off from work. 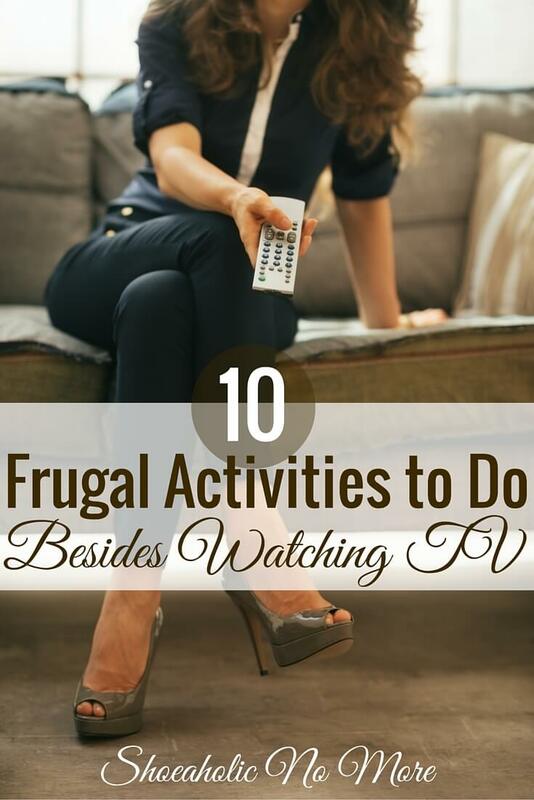 If you have the same problem as I do with TV being one of your only “hobbies”, here are 10 frugal things you can do besides watching TV tonight. I actually used to love going thrifting at garage sales and thrift stores. I didn’t always buy something, but it was more about the adventure and some of the really weird cool things you might find. Now that spring is here, garage sales are starting up in my area and again some thrift stores are staying open later now that it doesn’t get dark as early. This should make it easier for you to go thrifting in the evenings instead of watching TV. Back before I became obsessed with blogging and running my business, I used to love trying out new recipes for supper. Finding and trying out a new recipe is a good activity as it can bring more variety to your life and your pallet, and you might even find a new food or recipe that you love and can add to your regular rotation. One new recipe I tried and enjoyed was this one for a Zucchini, Black Bean, and Rice skillet. I’ve also recently been doing some freezer cooking, which can save you money and time in the long-run, but it usually takes up a whole evening to make up the meals. I don’t know about you guys, but I actually have two whole bookcases full of books I want to read but haven’t yet gotten around to. I used to buy books like they were going out of style with plans to read them right away, but then life happened. Now I can take advantage of having all those books by pulling them out and reading them before giving them away or re-selling them when I’m finished. If you don’t have the same clutter problem with books that I do, you can always check out a book from the library for free, borrow one from a friend or family member, or get used paperback books on Amazon for about $4 each with shipping. I’ve wanted to start a vegetable and flower garden ever since I moved into my house, but I’ve never gotten around to it. I’ve put some pretty flowers on my porch every year, but that’s about as far as I’ve gotten. Maybe if I didn’t watch TV I could actually start with a little garden this year. I do enjoy piddling around the house and yard working on various projects, but I don’t have time for it as often as I’d like. Again, if I gave up watching as much TV and working so much, I could probably find more time for these projects like painting, doing repairs, and decorating my space to reflect my tastes. There have been some projects on my list since I first moved into my house that I haven’t gotten to yet. I had been doing pretty well with my morning exercise routine until I went out of town. Then I finally picked it back up right before getting sick. I’m sure I’ll have to re-establish my routine again as soon as I’m feeling better. It would be easier for all of us to find time to exercise in the morning or at night if we decided to do that instead of watching TV. Better yet, you might be able to combine the two by making yourself workout during commercials or by walking in place while you watch your “guilty pleasure” TV shows each week. Most of us have at least one area that is more cluttered than we’d really like. Perhaps you can tackle this in a night or two instead of watching TV. I also recently found an awesome step-by-step decluttering guide that can help if you don’t know where to get started on your decluttering project. Check it out here! Ok, this is one that’s not on the list for me since I’ve already got 2 of my own sites to run, plus a bunch of clients that I help too. But if you are looking for a creative outlet, starting a blog is a great way to occupy your downtime instead of watching TV. Blogging is fun and it can be lucrative once you start earning money from your site. Podcasts are packed with useful information and you can find shows about tons of different topics, not just personal finance. I like to listen to podcasts while I drive, while I cook and wash dishes in the kitchen, and while I fold my laundry. It really helps occupy my mind so I’m not focused on some of those more dreadful tasks (AKA the dishes!). 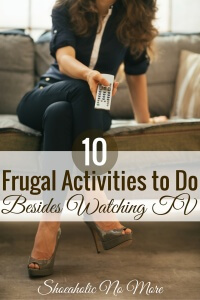 Can you think of anything else you can do besides watching TV? Great ideas! It’s so easy after a long day to throw myself on the couch and watch TV, but when I spend my time that way, I start thinking, “There’s got to be more to my life than going to work and watching TV!” I think what you’re getting at is the idea that we need to consciously spend our time on the things that will enrich our lives, rather than fall into habits that breed inertia (such as TV, checking Facebook, scrolling through Instagram, etc.). Good reminder, and nice list of activities! I prefer exercise or trying a new recipe. But, I can do both exercising while watching a TV show or a film. By the way, could you suggest a new recipe to try, Kayla? All great ideas. I’d add “invite a friend over.” I do find that when I actually have a free night at home & get the kids to be on time, I’m so elated I can’t decide which thing to do! Our city has tons of great museums that offer at least one free day/evening per month. This is a great way to save on a date night.